Our winery owners, Les and Dorian Linkogle remind us that “Sometimes you really do have to kiss a lot of frogs ’til you find your prince”. This may be true in many areas of life but when it comes to delicious wines you will find a prince every time you visit our premier Temecula boutique winery which opened its enchanting doors in 2007. This saying became the inspiration for our “Talking Frog” label. This label offers a budget-friendly introduction to our table wines to appeal to a price conscious consumer. Talking Frog is our unique bubbly wine lager that is light, sweet and fruity. As this label is less expensive than Briar Rose’s other wines, taste is not spared in any way. 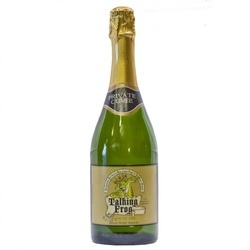 We are proud of our awards for Talking Frog Wine Lager that includes; a bronze in the Valley Wine Society 2010 and the Inland Empire Award in 2010. This recently released wine has the distinction of using 100% Viognier grapes and a lager Hefeweizen. Pronounced Vee-own-yay, the Viognier grapes were once only found in the northern Rhone region of France but were brought to California in the 1990’s where they adapted well to the climate. The Viognier grapes can now be found in many places around the world. This wine lager is unique and offers a true appreciation of the Viognier grape. A bubbly wine lager that is sweet, light and fruity.